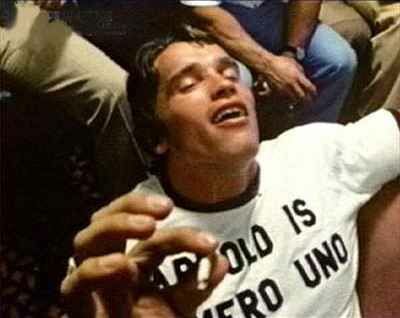 I’m already enjoying Arnold’s exit from his gubernatorial throne. He’s thrashing around, trying to appear relevant, as he drops off into irrelevancy. The quotes show his massive ego remains steroid-pumped. It’s always all about him. And he really does have “knowledge and experience”: Knowledge of how to wreck California. Experience wrecking California. He’ll probably get some kind of job in the Obama regime, maybe head of EPA, Energy or Interior. But because of wife Maria’s connections, not his own. The Kennedy Klan, especially Maria Shriver-Kennedy-Schwarzenegger and her late uncle Sen. Teddy Kennedy (D-Chappaquiddick), were big early supporters of Obama, crucial to his beating Hillary in the primaries back in 2008. So he owes the Kennedys. But everyone will be snickering behind Arnold’s back about how he misruled and wrecked California. He’ll always be a buffoon.